The 4th round of the 2015 Outdoor National Motocross Series was the first of the year on the east coast in Blountville, TN. The temperature was kept tolerable by some passing clouds and the occasional sprinkle, so the true test of heat and humidity still awaits the riders at future rounds. What Muddy Creek MX did pose however was the most race friendly track of the season thus far. There were ruts and lines and bumps, but not so severe that riders were just on survival mode. Lap times were pretty close but passes were being made often. The most riders were certainly overtaken by Jason Anderson and Zach Osborne. 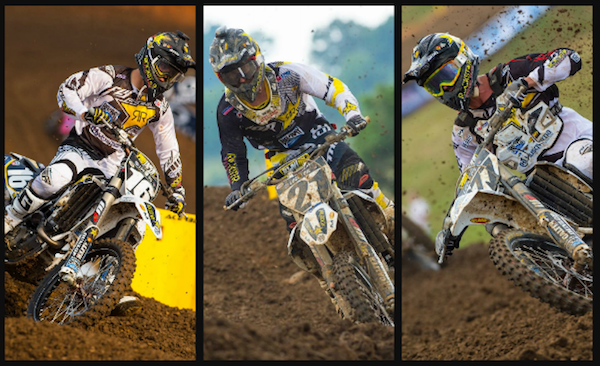 Jason Anderson has so much positivity to take away from his day in Tennessee. He got a great start in moto 1 and rode comfortably with the top guys in the premiere class to a solid 3rd. Thunder Valley and Muddy Creek are the two tracks he has the hardest time with so that finish was even more impressive. Jason is in his rookie season of course, but he has championship aspirations in the future. To win a title in the 450 class, you can't have bad tracks. You have to overcome whatever it is that makes you think you don't do well somewhere. In moto 2, Anderson put in a championship caliber ride all the way. Finding himself mired way in the back of the pack on lap one, it appeared that the hopes for a podium overall on the day may have been diminished. Then suddenly he began moving forward at a very rapid rate. Picking off ten riders a lap for the first couple go arounds. Suddenly JA was catching the 5th place guy by 2-4 seconds a lap. In fact his fastest lap time took place with just 3 or 4 laps to go. By the time the checkers waived, Jason had made such a surge that the 3rd place rider was in his sights. 4th in the moto was good enough for 3rd overall and one of the most impressive rides for anyone in recent memory. Jason Anderson: "My weekend was a really good one. I had good times in practice and a good gate pick for moto 1. In the first moto I got off to a really good jump right up front. I was able to hold on for 3rd and I felt really good. In the second moto my first lap was terrible. I didn't get a very good start, putting me mid pack in the crowd. I got into a small incident that cost me some positions and pushed me all the way outside the top 30. I just did my best and kept pushing. I made it all the way back to 4th for 3rd overall. It was one of my best rides ever! Muddy Creek has been a track I've struggled with in the past so to come out with a podium is awesome. Some of my favorite tracks are coming up so I want to be on the box more in the next few rounds." Zach Osborne was really excited for this past weekend. Growing up in nearby Abingdon, VA, he rode this track a lot growing up. Unfortunately for Zach however; this was not going to be his day. Both motos were near carbon copies with less than stellar starts and first lap crashes. The way he rode was a completely different story. He had to come from the middle to the back of the pack in both motos. He came all the way up to 9th on each occasion and never gave up. The results on paper do not show the effort he put in on the day as they usually don't but it was a very commendable performance. Zach Osborne: "Today was pretty good, in practice I had good speed again, I felt good on my bike and my settings were good. In the first moto I got a mid pack start and fell on the first lap and left myself with a long ways to go, so I just put my head down and came all the way back to 9th. It was a great ride considering where I came back from but certainly not what I was looking for. In the second moto I got off to a little bit better start in the top ten but I fell on the first lap again. This time it was totally my fault but I didn't lose as many positions, maybe fell back to around 20th and came back to 9th again. Going into next weekend I have a good feeling. I really like the track we're going to and it's good for me, it gets deep ruts, gets pretty gnarly and I raced there a lot growing up. I need to get my starts figured out this week. I've had good starts all year and I don't know what happened. Last weekend was really positive and I felt like this weekend should have been the same." Christophe Pourcel had his roughest outing of the year since joining the team and the 450 class. In moto 1 he got in a pileup early and got up nearly dead last. In moto 2, he got a bad start and couldn't match his teammates passing success. He just wasn't comfortable on the day and will have to move on to next week and let the bad day go. He has been very consistent through the first three rounds and shouldn't let this one day bring him down. Christophe Pourcel: "In practice I ended up 3rd which is a pretty decent position but we are more focused on trying to get me more comfortable on the bike than doing lap times. That's just not the goal right now. In the first moto I crashed in the 2nd corner when someone went down in front of me and I hit their bike. I was pretty much last and I came back to 20th before making a stop in the mechanics area. I was riding tight and not so good with pain in my arms. We made some changes to the suspension for the 2nd moto and it was better but my gate position was way outside. I got a bad start around 15th or 20th and just rode with the group around me. It was a bad weekend so now we'll just try and rebound." The series heads just north to Highpoint MX next weekend in PA. Anderson, seems to have found some untapped speed, putting him legitimately in the category of the riders leading the championship. With his favorite tracks upcoming, he plans to make several stops to the podium in the near future. He landed on the podium at Highpoint a year ago. Osborne just needs to dial his starts in and he will be back on the box. His speed and fitness are good. Pourcel needs to let last weekend go and focus on the next. His goals moving forward after next weekend are to be in contention for top 5's every moto.